The unit is very small and light. The build quality is reasonable but feels rather “plasticy”. The alignment of the LCD to the display window is slightly off, a few left-most pixels are not visible when viewed straight on. Push buttons are good, they have nice tactile feel. The slide on/off switch is not so good, the switch is difficult to slide and the swith doesn’t provide that “clicking” feedback. The supplied probe (or rather test clips) is quite usable. Probe cable length is 0.5m. This is a good length, given that the unit can be easily placed close to the project you are debugging. A nice soft pouch is provided for storing the scope. Inside the box: The unit itself, backplate, clips, test probe, precut double sided tape, battery, manual, and soft pouch. 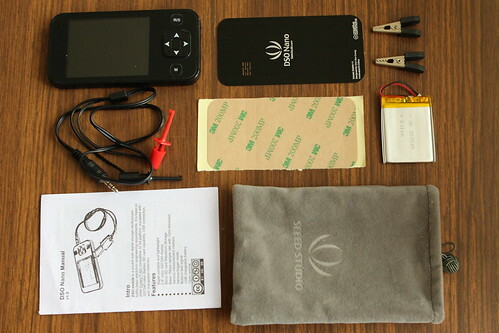 The display is a 2.8” 320×240 LCD display. The display is very good. The screen is crisp, bright, and of high contrast. Firstly, it is a single channel scope. This means that you have no chance of seeing timing relationship between two signals. Secondly, the sampling rate is limited to 1Ms/s. This limits the usefullness of the scope to signals lower than 100kHz. This is very low for an oscilloscope. This is sufficient for audio signals or slow speed digital data like 115200bps asynchronous serial. Thirdly, the input stage is only DC coupled. Without AC coupling you can’t see small ripple superimposed on large DC voltage. The refresh rate of this scope is good. The responsiveness of the user interface is also good. On some vertical gain settings (2, 5 and 10V/Div), the vertical accuracy is off by 8%, while on other settings the accuracy is off by 2.5%. There are no means provided, either by firmware or by trimpots to adjust these vertical gains. On my scope I trimmed the gains by soldering extra resistors in series/parallel with the gain setting resistors. Input stage capacitances have not been tuned to provide flat frequency response. On the 2, 5 and 10V/Div settings, with square wave as input, there is a large 16% overshoot. On my unit I manually trimmed these by soldering extra capacitors on the provided unmounted pads. There are AUTO, NORM(al), SIGN(single? ), NONE, and SCAN triggering mode. AUTO works as expected. NONE starts capture without waiting for any trigger condition. SCAN also start the acqusition without waiting for trigger condition. The difference is that SCAN don’t fill the entire capture buffer, the screen refreshes as soon as the trace hits the right of the screen. I can’t get NORM and SIGN to work. There is positive and negative edge triggering option. There are two horizontal and two vertical cursors provided. Time and voltage differences are displayed on the status bar. The cursor’s line can be turned on/off. Timebase accuracy is spot on as expected. Battery wires are soldered directly to a couple of surface mount pads with no mechanical strain relief. This is bad. Overtime this solder joint will break, possibly shorting the battery. The unit do not have any kind of EMC shielding. The PCB itself is only a two layers board with no ground plane. This oscilloscope is definitely not intended as a professional equipment. In the presence of strong electromagnetic radiation, you will get erroneous reading. Noise is visible on high sensitivity setting. The input amplifier exhibits high gain at high frequency for gain setting of 2, 5 and 10V/Div. With square wave input, this shows itself as random spikes at the square wave transitions. No anti-aliasing filter in the hardware circuit. This is especially necessary because of the low sampling frequency. Any frequency component of the signal above 500kHz will be aliased in and will confuse the reading. Horrible battery charging circuit. The lithium polymer charger consist of a 1 Ohm resistor in series with a diode connected to the +5V USB. This is NOT how you charge a lithium battery. There is provision on the PCB fo a proper lithium polymer charger chip to be mounted but Seeed Studio in their wisdom decided that a diode circuit is sufficient. This diode circuit must be replaced with proper lithium-polymer charger chip. I am currently trying to ask Seeed Studio to send me this charger chip. User interface is difficult to use. Scrolling through the 4096 points capture buffer is painfully slow. There is no trigger hold-off setting. NORMal and SINGle triggering options do not work. The oscilloscope has a 10x setting for use with a 10x probe. I do not see the advantage of using a 10x probe with this oscilloscope. Captured trace can be saved to an optional micro SD card. This trace can also be transferred and displayed on a PC. This feature is nice but is not very useful for me. It has automatic measurement feature. It measures DC.V, Vavg, Vrms, Vpp, Duty, Cycle, and Freq. This is nice, but I’d rather use the built-in cursors to make measurements. Did I mention the small size? Did I mention the beautiful LCD screen? Battery powered means the oscilloscope is floating so I can connect the ground probe to any part of the circuit. The firmware source code is available for modification. Currently, only source code for older firmware is available, but I am hoping that they would release the source code of an up-to-date firmware. Additional features like data logging can hopefully be added. This oscilloscope is cool and fun to use, however there are hardware and firmware problems that seriously degrade the quality of the product. Many of those problems should be easily fixable. The scope does have its limitations. This scope will not be suitable for everyone, it is not a “real” scope replacement. However if you are aware of its limitation, then this scope is very capable and great addition to the toolbox. Consider getting a second hand Tektronix 2400 series oscilloscope. The Tek 2400 scope is really good. If a logic analyzer would suit you better, consider the Intronix LogicPort logic analyzer. If you really want a digital storage scope, then those Rigol scopes are good value for money. If you do have lots of money and I mean lots, you can consider getting the Tektronix TDS5000 series oscilloscope. I’ve used a TDS5104 at work. 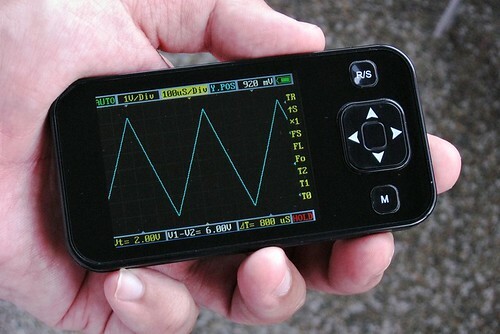 It is really good and it is the first digital scope that I used where I didn’t feel I’d rather use an analog one. Can you provide any more details on the modifications you did to the scope? The capacitors and resistors you soldered on. R1 and R2 forms a voltage divider that sets the gain for 10mV, 20mV and 50mV and 0.1V/Div settings. R1, R2 and R7 forms divider for 0.2, 0.5 and 1V/Div settings. R1, R2 and R6 forms divider for 2, 5 and 10V/Div settings. First work out the gain accuracy of your scope for 0.1V/Div, then adjust either R1 or R2 (by placing a resistor in series or parallel to it) to compensate for it. Then work out the gain accuracy for 1V/Div, then adjust R7. Then work out the gain for 10V/Div, then adjust R6. As for the compensation capacitor, C2 is responsible for 10mV, 20mV, 50mV and 0.1V/Div settings. C7 for 0.2, 0.5, 1V/Div. C6 for 2, 5 and 10V/Div. If, for a square wave input, your trace shows overshoot, then increase the corresponding compensation capacitor. Using the charging circuit described above, how long would it take before the lithium battery either exploded, or was badly damaged? I’m not going to order this device until Rev. 2. is produced. Hopefully, the Seeedstudio folks will work with the developer, and fix this rather critical issue. SeeedStudio did end up sending me the Linear Technology LTC4054 charger chip which I mount myself. Many factors contribute to the time it takes before the battery gets damaged: USB voltage which can be anywhere between 4.75 to 5.25V, whether your USB port does current limiting, the amount of time you leave the unit charging and how well the battery protection circuit works. Can you show a few pictures how you integrated that IC in the Nano? Unfortunately I didn’t take photos. Mounting the IC is quite straight forward as there are already pads on the PCB. Remove R21 and mount U1 and R27. Could this scope be used to accurately measure clipping in audio equipment? Does the lack of a flat frequency response impair this? Nice review, there have been some changes in the UI since this article was written and a V2 unit that addressed some of the hardware issues. those ripples you mention in the square wave transition, could this be due to using a finite fourier seriers, you have to truncate the infinite series at some term. See Gibbs phenomenon (wiki). Can this unit send out generated waveform signals to some other circuits input? Or does it only read signals from some source. Thank you for your detailed report. Appreciate your feedback. Thank You. This particular version of the DSO nano does not have signal generator functionality. It does have a square wave output pin. This is normally used for adjusting the compensation capacitor of a x10 probe. Not much use for anything else.